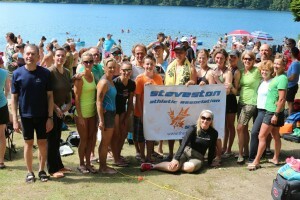 We encourage athletes and triathletes of all abilities to come out and join one of our SAA scheduled training sessions. If you are unsure whether SAA is the club for you then before signing up, come on out to one of our training sessions and talk to our members. We look forward to seeing you at one of our scheduled swim, bike or run sessions. TriBC provides an additional $5 discount for member affiliated clubs. This discount is available for SAA members, and is separate from the early bird discount mentioned above. Once you login to your CCN account and select the membership type (Athlete for most people), make sure you indicate you are belong to a TriBC member club and search for Steveston. Follow the process through, and when you get to the checkout, this is when you must enter the Club Discount Code (shown below) in the Promotion/Coupon Code at the bottom of the screen. It will then show the Club Member discount that has been applied (in addition to the early bird discount). The screen below also shows a Triathlon Canada Membership that is automatically added as well (previously it was transparent). SAA club membership fees for 2019 are $25. The membership fee has been decreased this year by $10. Those who registered before we reduced the fee will get $10 back. Membership fees go towards social events and help us subsidize all our programs. We accept cash, cheques made out to Steveston Athletic Association (post-dated to January 1st if at end of year), or electronic email transfer (contact us for details). The membership form and waiver is available here. Complete both forms and have your signature witnessed for the waiver., and then give the forms and payment to any of the SAA Board of Directors.